RANTWICK - Commuter Cycling in London Ontario | A Bike Blog: What's Your Poison? I have some ideas for blog posts that will take some time to create/compose, but life did not permit me to work on them in time for today. As you may know, I almost always post something on Mondays, even when I've got nothing. More and more of these Monday posts seem to be about nothing lately, and I apologize. Perhaps I will re-find my blogging stride soon; I sure hope so. Anyway, while hanging around my house late last night wondering what kind of nothing I would write about for this Monday, I paid a visit to the fridge. Therein lay both my inspiration and my shame, because my eyes seized upon my greatest nemesis when it comes to bizarre/sickening food consumption: maraschino cherries. I had one and put them back. A few minutes later I swung by again and had three or four more. About ten minutes later I returned and ate the rest. I polished off a 2/3 full jar of maraschino cherries and then drank the sweet syrupy juice that was left in the jar. I have a sweet tooth, but no other type of food makes me do anything this freakish. Thankfully, it is not a normal thing for the Rantwick household to stock my strange personal poison. Please feel free to go ahead and judge me for my disgusting behaviour. It is, after all, pretty gross. While you're busy wagging a mental finger at me, however, I would be curious to know if any of you have any strange and hard to resist nemesis foods, foods that cause you to deviate from what I am sure are your otherwise completely normal and non-freakish consumption patterns. I'm almost afraid to ask, but what's the strangest thing you ever pigged out on? Pickled herring. There's a little German lady at the farmer's market here that makes it and I can't get enough. It may not be that freakish a food, but I can easily eat an entire jar, even the onions. In my defense, I can feel briny fish creeping up my throat at the thought of maraschino cherry juice. Nacho Doritos and Chocolate...At the same time! (preferably a kit kat bar) Stuff 3-4 chips in my mouth then take a bite of chocolate then chew. mmmmmm yummy. Wow! This is starting out well. You all make me sick, which is pretty much what I was after. Knowing full well what they will do to me on the way out, I'll tear into a dozen pepperoni sticks as hot as they can be made. Strangest thing I've eaten is a sea turtle steak in Mexico when I was a kid. I've had calf fries at a restaurant in Waco, Tx. My aunt used to cook goats meat (cabrito) with a spicy blood sauce. I love cow tongue (lengua) tacos. My mother-in-law makes them for me every time she's in town. Pickled green beans. Prepared just like cucumber pickles, but with whole green beans instead of cukes. I can eat a whole jar at one time. Chris - oh, the pain, the pain! RTP - Holy carnivor's delight! Cow tongue taco? EEeewww. Big Oak - those actually sound pretty good! Keep 'em coming everyone... this is pretty fun. Dude! I LOVE Maraschino cherries! I will polish off a whole jar in one evening as well, and drink at least 1/2 the juice. It's sick I tell you! Also, you should try cottage cheese with maple syrup. Good stuff! drummergeek - God bless you and your sick, twisted addiction. I just made that whole post up. OK... kidding. It is good to know I am not alone. You, however, will remain alone in your tree sap & lumpy runny cheese thing. For me, it is anything sweet! I have been known to put away a jar of Strawberry preserves, without hesitation, in a matter of minutes. So, dear Rantwick, keep your fridge under lock and key, when I am in your neck of the woods. Chandra - Hey man, my fridge is your fridge. Locking it might create the first ever pacifist smackdown, and I hate to think of it. 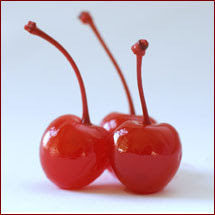 I have, at least once, had a willpower breach and done the same with Maraschino cherries. There usually aren't any around here. Sometimes I think I have a chemical addiction to cheddar cheese. I can't leave it alone. Another kindred Maraschino masochist! +1 for cheese. Mmmm, cheese. My poison? Torilla chips dipped in lox-infused cream cheese (doesn't sound terribly freakish to me, but my roomie thinks it's gross, gross, gross). I won't even buy the lox cream cheese stuff anymore, because I will literally sit and eat the chips 'til the cream cheese is gone. Same goes with the lox spread on salt bagels -- I'll wind up eating 4 bagels in one sitting, because I don't like the spread too thick. Jeez. I can handle the salt (my blood pressure is below-normal and I'm granted a little leeway with salt due to orthostatic hypotension), but there's something horrible about eating half a pound of fat (and then some, counting the fat in the chips or bagels) in one sitting. Ugh. Thinking about it makes me wonder how, exactly, I do it, LOL. That actually sounds pretty good. Excessive, but good.